In countries where men and women share housework more equally, married men are more likely to be unsatisfied with their share of household duties as they report taking on a greater share of household chores, according to a new study from researchers at Emory University and Umeå University in Sweden in the journal Social Politics. In other words, men are more likely to feel it’s unfair when they tackle a greater share of household chores in countries where a more egalitarian division of labor is considered the norm. The study, which included survey responses from roughly 14,000 men and women under the age of 65 who were married or living as married from 30 countries, is the first to examine the perceptions of men about fairness and satisfaction related to housework. Across all countries, women reported doing on average 75 percent of the housework. 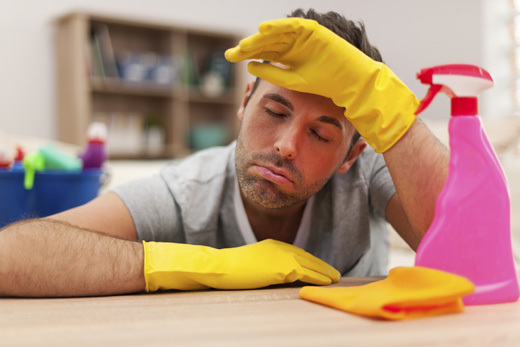 Men reported doing on average 31 percent of the housework. These numbers don’t equal 100 percent because they are based on self-reports of respondents’ own behavior as well as their spouses. So where are the men who report doing at least 50 percent of the housework? Roughly 38-30 percent of men from Poland, the Unites States, Australia, Denmark, Mexico, the United Kingdom, Latvia and Sweden reported handling at least 50 percent. Roughly 15 percent or fewer of men in Portugal, the Czech Republic, Chile and Japan (Japan ranked dead last with only about 6 percent) said they did at least 50 percent of housework. Men from more gender egalitarian countries, such as the United States, Sweden and Australia, were the most likely to believe they were doing an “unfair” amount of housework when they perform a large share of the household duties. Interestingly, men who do more household work in countries where men, on average, do less, such as Japan, were less likely to feel that their chore burden was unfair. It seems odd that men in countries where both men and women are expected to tackle chores would feel more dissatisfaction and a sense of unfairness. The explanation could be that men in these countries seem to be more aware of housework, unlike men in countries where women are simply expected to take care of household duties, says Sabino Kornrich, assistant professor of sociology at Emory University and lead researcher on the study. Maureen Eger, a sociologist at Umeå University, was the co-author of the study. “We presume that living in a more egalitarian society highlights the importance of housework in general, making men more conscious of it and thereby sparking a more negative response the more of it they do,” says Kornrich. “That suggests there’s a norm when men and women live in egalitarian countries that housework is an important, shared responsibility,” Kornrich says. In less egalitarian countries, such as Japan, men don’t seem as aware of housework and are less likely to feel unhappy whether or not they do a lot or a little of their family’s housework, Kornrich says. Previous research has examined how women in different countries perceive their share of housework and how fair or unfair they find their duties. Women also perceive less fairness and satisfaction with family life in more egalitarian countries, which could suggest that they are influenced by how their workload compares to other women in their country but is also consistent with the presence of a norm that equal household contributions are important, according to Kornrich.